Sunday September 6th – 5pm to Gather and share Pot Luck – 7 pm to pummel each other with mushy Tomatoes! Then Plunge in the pool to get the seeds outta your hair, Change into your clean, dry clothes and hang out with us, honoring the hard work so far, and the coming of Autumn!! ALSO, North Slope Farm is Commemorating its 20 Years serving the Community with Fresh Organic Food! In 1994, Mike Rassweiler, with the help, investment and support of his family and friends, embarked on the Adventure that has become known as North Slope Farm. There have been many forms and varied outlooks at North Slope, but throughout that time the focus has been of investing in a positive environment, regeneratively producing valuable products. In 1995 we began serving the community with Fresh, Organically Grown Vegetables, Herbs and Flowers. One goal was to be “operationally” profitable in five years. In 1999, we achieved that goal, but assessments of related costs and limitations caused me question the viability of the business plan. Not least of which is the high cost of living in the area, and because of that, the difficulty finding skilled and available labor. I also had a steep learning curve, costing thousands of dollars in low yields, over the years. The experience has been profound though, and it was clear to me that the Experience was valuable, and making it accessible to others who seek it, would be a great service! I utilized my experience gained over the years, to foster an intensive, experiential learning environment, for committed individuals. Many folks went through the three year process, learning valuable lessons and contributing to the environment for those to follow! It has been a rich and dramatic 20 years, and I am grateful for the chance to have shared so much with so many – Thank You For Your Interest and Support!! NOFA-NJ did us all a favor by bringing Eliot Coleman, Author of The New Organic Grower, to speak as our Keynote. His focus on “Anything is Possible” was inspirational and photos of his operation profound in their simplicity and beauty. Eliot grounds the organic community in the power of principle, that building healthy soil, and minimizing stress to our crops, will yield bounteous crops over the long haul, without expensive off farm inputs or environmental degradation. According to Eliot’s example, small land holdings not only can feed our communities, but they should be our Societies Primary (food) Focus. I was honored to be a presenter at this Conference, speaking both Sat and Sunday. I was joined in the discussion of Mentoring Apprentices by Judy VonHandorf of Genesis Farm, Eve Minson of NOFA-NJ and Christy Asbee of Law for Food, LLC. Legal issues were laid out for future discussion and review, and North Slope Farm’s and Genesis’s Training programs were presented in detail. I was struck by the awareness of how much Michael was prepared to share of his experience and wisdom, and that the hour was not enough to get but a taste. My take home impression was the importance of building a ‘fungal soil’. Organic farmers as a rule are invested in building the organic matter in the soil, which in turn feeds and sustains the Fungal Life, which in turn serves the health of crops. He recommended liberal, annual applications of small piles of (hardwood) wood chips to the orchard, piles that add fungal vigor to the soil. Likewise the management of diverse species of grass and broadleaf plants below the trees to promote a nutrient replenished soil within the top 10” (monocrop grass leads to nutrient poor surface soil). He recommends scything the undergrowth down, when farms are cutting their first hay, leaving the organic matter on the soil surface as mulch. Michael also recommended cutting prunings into small pieces under the tree to be broken down naturally. Apparently the small branch tips have the most benefit for sustaining fungal properties of the soil due to their high percentage of juicy buds to woody core, and don’t need to be removed unless severely diseased. David educated me about how the whole Fungi being good for plant growth works. He described the process by which sustaining a healthy, vigorous, fungal soil actually works with plants. The Fungi develop “microscopic tree like structures in the plant root cells (arbuscules)” that grow out into the soil farther than root hairs. These fungal branches (hyphae), into the soil, can hugely increase the potential of plants to take up nutrients and water, especially in adverse conditions. The good news is that standard Organic Management practices are perfect for protecting the Fungal vigor of soils. The one exception is tillage, and repeated tillage, especially “stale seed bed techniques” can kill off the fungi in our cropping areas. To address problem areas (lack of fungal population), David is focused on a simple process any grower can manage – though of course there are details to consider. Once you know what type of AM Fungi is native to your soils, and establish that they are beneficial for the crops you plan to grow, we can foster their growth in controlled settings (grow bags planted with an annual grass), then mix the resulting fungal rich media into our potting soil for transplants. The AM Fungi will quickly reestablish its beneficial effects in the field, growing out from the transplants. These interactions between Fungi and soil foster the development of “glomalins” (glycoproteins), the magic of decomposed organic matter, that holds our soil texture together. Andrew is clearly a man driven by his awareness of the world around him. Knowledgeable about the harm that humans have done, he is an inspirational speaker about examples and potentials for humankind to do a whole lot better. He had a lot of information to share and ended the talk with some great examples of his main point – We need to design our Development, and redevelopment, to capture the real value of living systems. Biological filtration of waste and ecologically sound utilization of nutrients and energy. The power of compost to regionally manage what otherwise is treated as Waste. The potential for Urban settings to capture and utilize rainwater and waste to sustainable foster human settlement. The take home message – don’t wait for someone else to come up with the solution, put common sense practices to work in your home and communities. Capture rainwater, grow food, compost, use plants to filter air/water, reduce heat and cooling extremes and then separate grey and black water and handle them as resources not waste! This was a testament to the growing commitment of Government Resources to address the topics that Organic Farmers have been talking about for generations. My thanks and appreciation to the following folks who contributed their time and expertise to the Panel; Karen Kritz – NJDA, Erich Bremer- NJDA, Matthew Pavone-FSA, Jack Rabin-NJAES, Justine Cook-NJDA and Gail Bartok-NRCS. Jack Rabin pointed out that he is frustrated by Organic Farmers not taking advantage of the wealth of accumulated knowledge of conventional agriculture. Two resources he touted were The Rutgers Commercial Vegetable Production Recommendations, and an On-Farm Composting web resource on the Rutgers- NJ Agricultural Experiment Station website. In general, these agencies will respond to the expressed needs of regional Agriculture, breaking down the barriers between serving Conventional Agriculture and Ecological Agriculture will only lead us to a better place. Karen has been working for years, trying to make the recycling of waste agricultural plastic a reality in NJ. 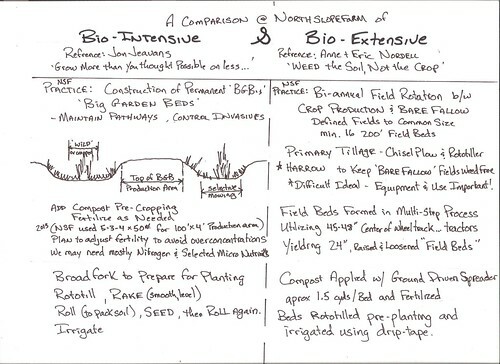 The Natural Resources Conservation Service (NRCS) has been a leader in adopting the principles of Organic Management and offers programs designed to incentivize Transition to Organic Practices, Nutrient Management and Cover Cropping. As always, Erich of the NJ Organic Certification Program offered real time understanding of the challenges facing Organic Farmers and serves as our advocate in the NJDA (poor guy, it’s lonely in there). The NJDA has yet to include the Organic Certification Logo on their website home page, embarrassed I guess, to be associated with a bunch of counterculture hippies. North Slope has invested a lot, recently, in fruit trees, and getting advice about their pruning and management is greatly appreciated. It is always nice to have an expert bring the task to life. These guys brought multiple samples of branch and trunk development on which to demonstrate pruning techniques. It was the end of the weekend yet they still were able to get me excited about going out and getting started on the Pruning! Another excellent Winter Conference, attended by a great crowd, with many more workshops than I was able to attend. Thank You NOFA-NJ for the commitment and time it takes to make this come together! North Slope Farm’s training program officially began in 2006, when the basic framework of Training assumptions were put to the test. Our business is operated as a completely open book, ideally introducing trainees to all the steps of business management. There is so much detail to Introduce trainees to that we break the operation down into Elements. (The Elements are listed as sub categories, under Training, on the right hand side of our Web Site). The first step in Training is to introduce the Elements, and start the process of prodding the Trainee to see the Operation as the sum of its parts. The Program will succeed only as a three year process, by the Third year the farm has the potential of benefiting from experienced workers who will help inspire and maybe challenge First and Second Year’s. Best case scenario, Third Years will be taking on their own Special Projects; that might provide other Trainees with additional avenues of exploration and inspiration. The Academic Piece of the Process, is the requirement, that all Trainees contribute to regular Monthly Summaries, Date Collection and Annual Summaries that are utilized to assess the farm’s production, strengths and weaknesses and potential viability. • First Year- Trainees are introduced to as much as possible, and gain proficiency in Planting, Crop Care, Harvesting and Washing of hardy crops. • Second Year- Mechanical equipment training is the focus in the second year, and Trainees must choose an Element as their “Element Focus”. This focus is the basis on which the Trainer can push the Trainee to express deeper understanding and responsibility for specific topics. Trainees must publish as Introduction and Summary of their Element Focus. • Third Year- Trainees are expected to model good behavior, and set a standard of productivity and responsibility. They are also encouraged to branch out into Special Projects of their own, or better yet, to improve on existing systems so the Farm Operation will benefit. There is the Manager’s assumption that Third Years will be crew bosses for the morning shift (as needed) but given the freedom of self directed work in the afternoons (if possible). They are also responsible for an Element Focus, even to the point of describing the full function of an Element, assessing its value and striving to manage that reality. They must also publish their Introduction and Summary of their Focus and any Special Projects they undertake. • Discussion and Presentation; often including related issues and options. • Demonstration; practical information for “how to do it”. Purpose of the Program and Societal Relevance: We need more farmers, farming more small farms, and that will not change. Those farmers need skilled and responsible workers and our Operations need to be professional, viable and sustainable. By fostering sound Training Opportunities, we will build the Trade back to the significance it held for generations, when local farms fed local populations. Our intention in this presentation is to focus attention on New Agricultural Ventures – partly to honor them, in particular for their investment and commitment to agriculture in NJ, and partly to be sure their voices are part of the discussion about what does agriculture need to get reinvigorated and thrive in NJ.? A brief description of their operations. Brief descriptions of the practical elements of their operations – main crops, scale of operation, and market outlets. Before preparing the ground, planting area and livestock management areas for production, the panelists describe their vision – how did they picture their operation, or themselves engaged with their venture – what was the original vision? The panelists were asked to share a story or their thoughts about challenges they have faced so far. Additionally, what resources did they identify that have helped, or could help. What thoughts about their experience would they share with their community, so the community might seek to invest in and support their efforts, and the new operations to follow? Panel discussion beginning introductions, including the audience, and end of the panel announcements – including NOFA-NJ will sponsor any new farmers (ten years or less) who will attend the upcoming NOFA-NJ Winter Conference!! My thanks to the many folks who made the evening possible; from the crew at NorthSlope who prepared a unique and pleasing environment in our greenhouse, Steve Tomlinson who provided our audio recording, NOFA-NJ for another season of informative Twilight Meetings, our audience and our panelists for taking the time and risk of speaking publicly about their ventures!! The time went by quickly, without the opportunity to ask for more detail from the panelists, which is why we will use this post to provide an index for the discussion; names and links for mentors the panelists mentioned, definition for terms and any other details that might help. As New Jersey remembers how to grow its own food and necessities right here in the Garden State, we will need to pay attention to the words of our farmers – new and old. We need to support farmers by buying their products, supporting their efforts and asking for their perspectives!! Please share what you learn in the Audio Recording above and email us if you have questions – we will update the index in an effort to illuminate! Pam Flory, when at Spring Hill Farm in Hopewell. Matthew Conver, Cherry Grove Organic Farm, Lawrenceville. Kelly Harding, Cherry Grove Farm, Lawrenceville. Herdsman at Cherry Grove Farm, Lawrenceville. Jim Kinsel, Honeybrook Organic Farm, Pennington. 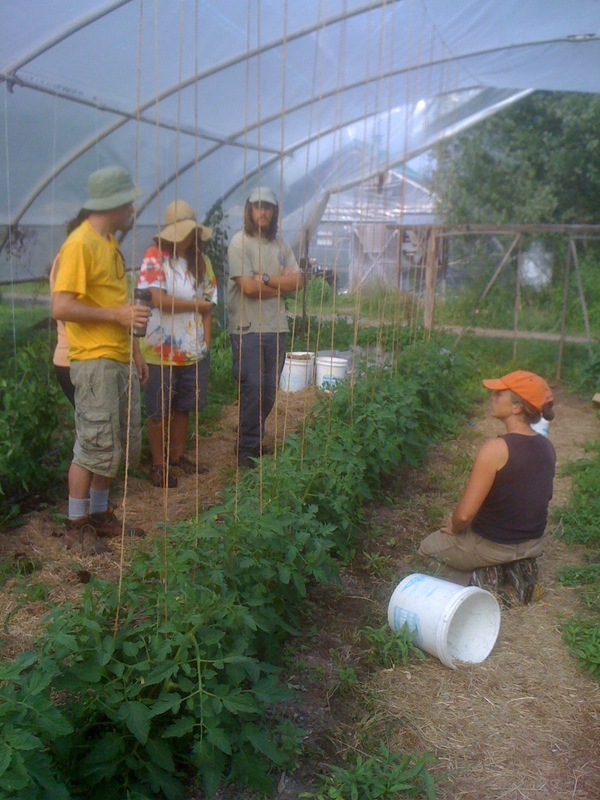 CSA – community supported agriculture. A term to describe the sale of shares of an operations anticipated yield. New Agricultural Ventures – Investing in New Jersey Agriculture ! Four New Ventures speak out for New Jersey Agriculture! We are in our third year of operation. My business partner John Applegate and I are research assistants at the Rutgers Cooperative Extension on Monmouth County where we learned about Organic/Sustainable Agriculture. When greenhouse space became available at the Rutgers EcoComplex we decided to start a business. We received our Org Cert and began growing herbs and leafy greens and began selling to local grocery stores such as Wholefoods and other small misc grocery stores as well as distributors. We are currently in the process of moving into the produce distributing/brokering/packing side of things and would like to expand into other non-produce items as well. In other words, our business is at a crossroads and are open to many various endeavors. This makes even more excited to meet and talk with other like-minded growers/entrepreneurs. You can feel free to call/email for any other questions or to discuss the specifics of the program in more detail at any time. 2009 was my first year farming full time. We sold 64 Summer CSA shares and 34 Winter CSA shares. This was done on 3 acres of ground and the greenhouses. This year (2010) our CSA grew to 113 Summer CSA members and 60 Winter CSA members. This is being done on 3.5 acres of ground and the greenhouses. We are currently in the process of adding another 2 to 3 acres to our certification for next year and look to break the 200 CSA member mark. Through the past 3 summers we also did some farmers markets, restaurant sales and a little wholesale as well. We are growing rather fast, but I am keeping everything well under control. We have grown transplants for another farm for the past 2 seasons and blended soil for another farm. We also sold our fertilizer (which we developed) to a landscape company for the past 2 years. The land that we farm is split in 2 locations right now. We will be adding another location for next year. We own no land, but rent it all. We travel 20 miles between farms right now. Some days I have been between the two location up to 3 times. The goal of our operation is to make a good living from the land. By that, I mean to say that I wish to live a financially comfortable life and be free to travel from time to time. I am very happy to be away from the stress of the construction business. Farming has its own stress, but I am more than prepared for it! Currently, besides myself, I have a part time driver, one full time employee and then 2 others who help out part time. In 2011 I expect to have about 6 to 7 acres in very intense production. I anticipate that it will take myself, 3 full timers, and another 1 or 2 part timers to do the work for the season. I look to gross over $200,000.00 in 2011 by growing our CSA to over 200 members. We will also do restaurant sales, wholesales and a farmers market or two. We are currently installing low tunnels to extend our seasons and will also be adding high tunnels for next year, if finances allow us to. I am confident that we will grow this farm into something really big within the next 3 years, but I will have to spend a fortune to prime the pump! I expect that we will be one of the most well respected Certified Organic Farms in the state of New Jersey well before the year 2015. I will have to think about how far I want to go after that. I just might settle down and enjoy the comforts of farming, or maybe I will go all the way and make an empire out of this thing! Run for cover! Run for cover! Rasta Taking Over! First production season began with spring harvests – March 2010. Chickadee Creek Farm currently is producing produce and flowers on two acres. Market outlets include two Farmers Markets, a ‘market share’ allowing customers to utilize prepaid credit to stock up at markets, including a sliding scale discount… And Restaurant Specialty Sales to The Brothers Moon, in Hopewell and Busters Café, in NYC. Goals for Chickadee Creek operator are best heard in person! Not least of which are making great food accessible to all and real farm income to support the reality of owning land in NJ. First production season began with spring harvests – 2010. Renting land in Lawrenceville, Z Food Farm is a “diverse vegetable farm” with market outlets including Farmers Markets, a roadside stand and Specialty Restaurant Sales. Another reason to listen to the driving force behind New Agricultural Ventures, a “simple” goal for Z Food Farm is to provide great food and great food variety to its surrounding community. First production is expected in June of 2011, but to achieve that, breeding goats were purchased and have been managed since 2009. Establishing herself on family land in Lawrenceville, the Piping Goat Creamery is intended to augment existing farmstand sales and wholesale accounts. NOFA-NJ Twilight meeting at North Slope Farm . Tuesday, October 26th at 5 pm. located on corner of Route 579 (b/w Routes 518 and 31) and Rock Road East. Twilight Meeting to focus on a few of New Jerseys ‘New Agricultural Enterprises, featuring their operators, discussing the season with North Slope Farm’s owner/operator, Mike Rassweiler. Also see www.nofanj.org for more events – and become a member! !